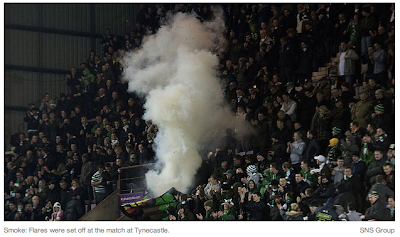 Eight people have been arrested following the match between Heart of Midlothian and Celtic. Police arrested them at the clash at Tynescatle on Wednesday after "disruptive behaviour" in the stadium. Six of the men, aged 30, 41, 43 and three 17-year-olds, are due to appear at Edinburgh Sheriff Court on Thursday after being charged under the Offensive Behaviour at Football Act. Two others, who were arrested over drunk and disorderly behaviour, have been released. Match Commander Superintendant David Carradice said: "Our priority is everybody's safety and we will take action against the small number whose disruptive behaviour spoils the match for the decent fans. “It is important to remember there was CCTV and video recording equipment within the ground. Working with our colleagues in the FOCUS unit, this will enable police to take action in the coming days to trace those responsible for unacceptable behaviour. "